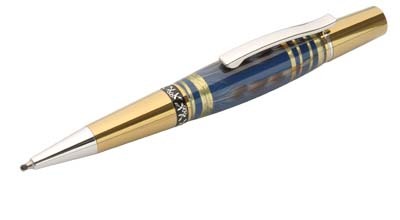 Anyone who has an interest in turning pens and other writing instruments will be aware of the wide range of materials and specialist blanks that are now available. 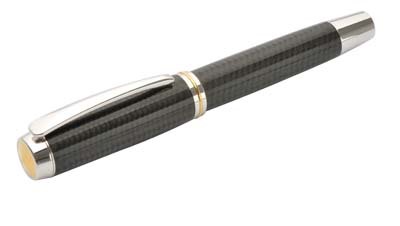 Most will have made pens using the Circuit Board blanks and perhaps some of the other clear cast blanks made from feathers or carbon fibre. Whilst using these ready-made blanks produces fine results for comparatively little effort, it can be an expensive way of making a pen and, for me, it does not satisfy my need to be creative and individual. 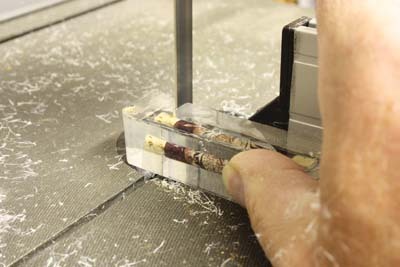 Creating your own clear cast or coloured blanks is not difficult and the usage does not just have to be limited to pens, although that is what I use it for here; however, bottle stoppers, cabochons, and infills for grooves and other decorative insets are just a few other options to explore. For this article I thought I would cover the fundamentals of using this resin by using it on a simple slimline pen kit. I covered the barrels with the Woodworkers Institute logo printed onto sticky labels. I have followed the three-stage process recommended by the manufacturers of the starter kit that I used, but it is also possible to create the blank in a single pour. All you need to do is create a support for the tubes that will raise them off the bottom of the mould. Obviously this will need to support the bungs that seal the tubes rather than the tubes themselves, or the support will end up as part of the finished blank. One way of doing this would be to turn your own bungs with the outer end a larger diameter than that of the finished pen. Whilst clear casting does not require the purchase of expensive tools or equipment, a range of items are required and must be assembled before you begin. None of these is optional so do make sure you have everything to hand at the outset. For the beginner, a good way of acquiring all that is necessary is to purchase one of the starter kits that contain all the items listed below. 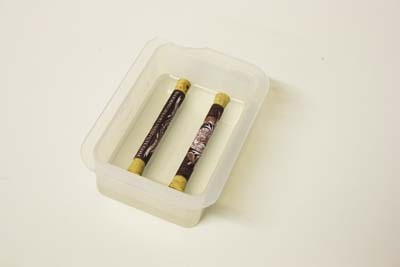 If you choose to collect together the materials yourself, you will need a suitable mould made from an appropriate material, a container in which to mix together the resin and catalyst, wooden spatulas or sticks for mixing the resin and removing air bubbles, lead shot to weight the tubes and cork or rubber bungs to seal the ends. 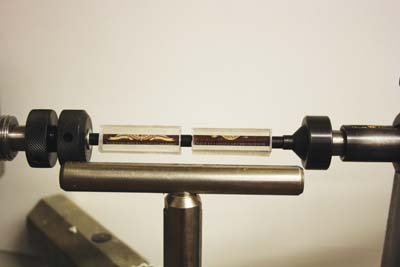 These are the main problem that you will encounter and are the one thing most likely to spoil your efforts, but whilst professionals will use pressure vessels or vacuum to de-gas the resin mix, this is not necessary on the small scale at which we are working; mechanically removing air bubbles with a cocktail stick during the period before the resin begins to set, or placing the mould on a vibrating surface such as a workshop machine, will ensure a successful result. 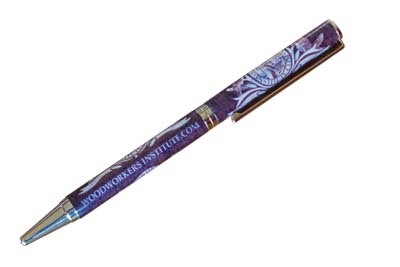 An attractive clear cast blank can be created either by colouring the pen tubes themselves, attaching small items that will be embedded in the resin, or covering the tubes with printed material. Whatever is used, you must make sure that the brass tubes are completely covered. Bits of tube showing through will ruin any effect you are trying to create. You will also need to make sure that whatever you decorate the tubes with is firmly attached. Anything that is capable of floating off into the resin will do so and will end up somewhere completely different to where you intended. Trying to reattach it in a mould of setting resin will not be a rewarding experience and is best avoided. As an alternative to clear casting you may also wish to experiment with creating your own coloured polyester resin blanks by mixing resin with coloured pigments and dyes, metal powders, etc. 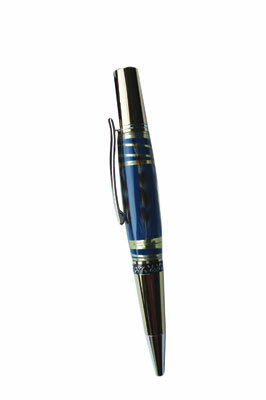 It is also perfectly feasible to make larger blanks to create bottle stoppers, handles and even small boxes. The methods used are similar, only the quantities and the size and shape of mould will differ. Moulds are readily available from hobby stores or online suppliers but it is possible to make your own wooden formwork with joints sealed with the kind of silicone sealant used for waterproofing the gaps around showers and baths. 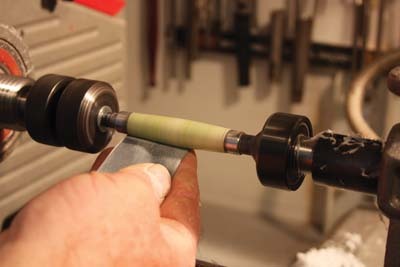 For cylindrical blanks, plastic waste pipe in various sizes plugged at one end with a turned wooden bung is a good option. After air bubbles, the clear casterâ€™s greatest enemy is dust. Make sure that the area where you are going to work is clean and free from draughts that can carry airborne particles, but do ensure that there is adequate ventilation for safety. Resin can make a terrible mess of your workbench so protect it with newspaper and have plenty of paper towels available to clean up any spillages. Make sure you have everything you need to hand, as you will only have a limited time to work before the resin begins to set. Also remember, as with any chemicals, the polyester resin and catalysts - hardeners - used need to be treated with respect and appropriate consideration given to health and safety. First and foremost in such considerations is the provision of adequate ventilation when working. Pour the mixture into the mould to form a layer about 6mm (1/4in) thick, continuing to take great care to avoid introducing air into the mixture. 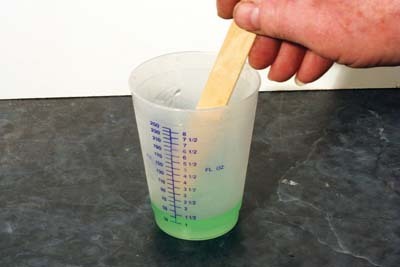 Slow, careful pouring is needed followed by removing any bubbles that appear in the same way as before. 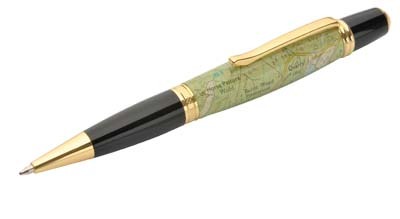 Walter Hall is a woodturner who has specialised in making pens and pencils for more than 20 years. 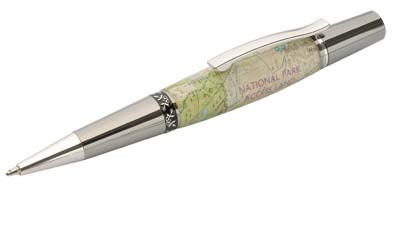 Based on the beautiful Northumberland coast in the UK, Walter sells his bespoke pens and pencils through local craft centres and via his website, details of which can be found below.